Ian was also looking for this same Mothercare bear, and he was able to find one in Madrid!!! I too am looking for a teddy the same as the picture. As Mothercare no longer sell this model I hope someone can help me obtain one either tan colored or light brown like in the picture. On the 22th Dec., my DH and our two sons were in the airport for the 7.30am flight to Budapest. (gate B22) Everything went fine until we were seated on the plane and suddenly realized that my 4 year old son’s favorite teddy had been left behind. We had left it at the gate and couldn’t go back to find it. To say he has been pining for it since is huge understatement. He chose that teddy in Mothercare when he was 10 months old and slept with it every night since. I tried lost property in the airport and at the service air desk but no luck. I tried Mothercare, but the line has been discontinued. I don’t know what to do at this stage except appeal to you all. If someone picked up the bear for safekeeping we would greatly appreciate his safe return. Also, if you have this brown, abt.12 inches long, teddy bear from Mothercare that your kids do not use anymore, please get in touch with me, as it my be the lookalike of the one my son lost. 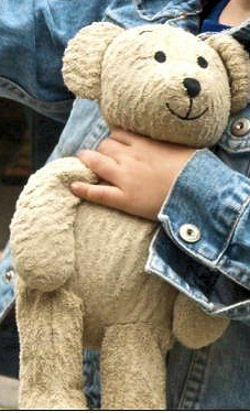 If you can help Laura find this Mothercare light brown bear, THIS SITE IS NO LONGER ACTIVELY MANAGED. Please use Our FREE FACEBOOK GROUP, including #021908-6 in the subject, . We are looking for same teddy, or a third replacement. Purchased six years ago for the first time. Lost four weeks ago in Paris. ANYONE who has an idea where we can get one, do let us know. Please CONTACT US Frank. We can’t help if we can’t get email you!!! These teddy bears are available on Ebay – but be prepared to pay up to £30. If it was that precious – then it's worth it! Search for Mothercare teddy. Here's a couple on there at the moment….. I couldn’t find any record of anyone else searching for this bear, with the exception of the Anonymous commenter, who did not leave any contact information. HI,I HAVE THIS VERY BUNNY LISTED ON EBAY AT THE MOMENT,LOOK FOR SPUDDYBUMP AND YOU WILL FIND IT!! I bought a similar one from Mothercare in Mumbai and still have a few stock left when I picked them up. You can write to them at mothercare@shoppersstop.co.in or call them at these numbers : (00 91) 22 264 35424, (00 91) 22 264 34501, (91) 22 25707028. My 4months baby is already attach to the bear.